Several caps I’ve seen have double ruffles. On Smiths 6608-D, they are made of finer cloth than the rest of the cap, and the finishing hem, about 1/16″ across, has stitches so fine I couldn’t see them to count them. The effect is like an edge of tiny silk ribbon. Smithsonian 6608-D has a doubled ruffle whose edge is invisibly hemmed. The cap is housed in the textiles collection of the Smithonian’s National Museum of American History*, a part of the Copp Collection. The museum date is 1775-1799. The record for this item is not online. The caul and headpiece are made from handkerchief-weight linen, but the ruffles are finer. 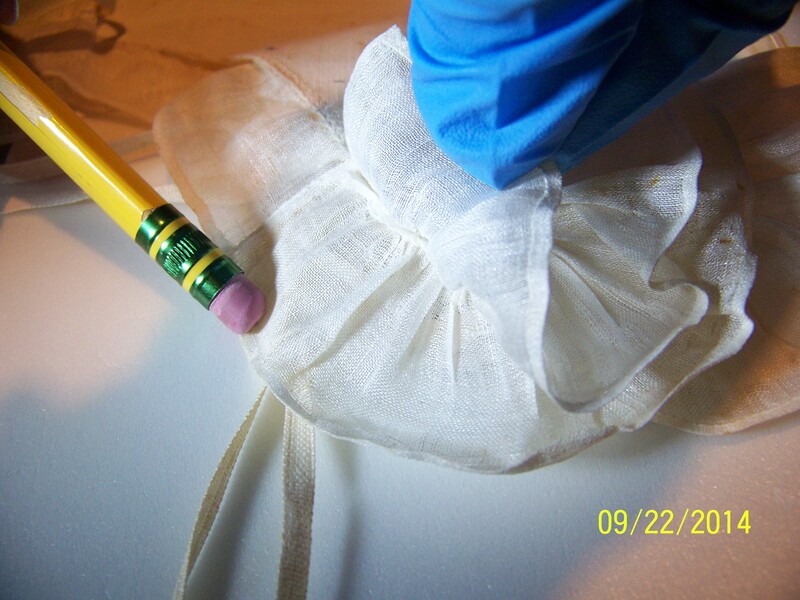 The headpiece, including the lappets, is 10 1/2″ from tip to top. The Caul is stroke-gathered to the headpiece, and the edge left unfinished inside. 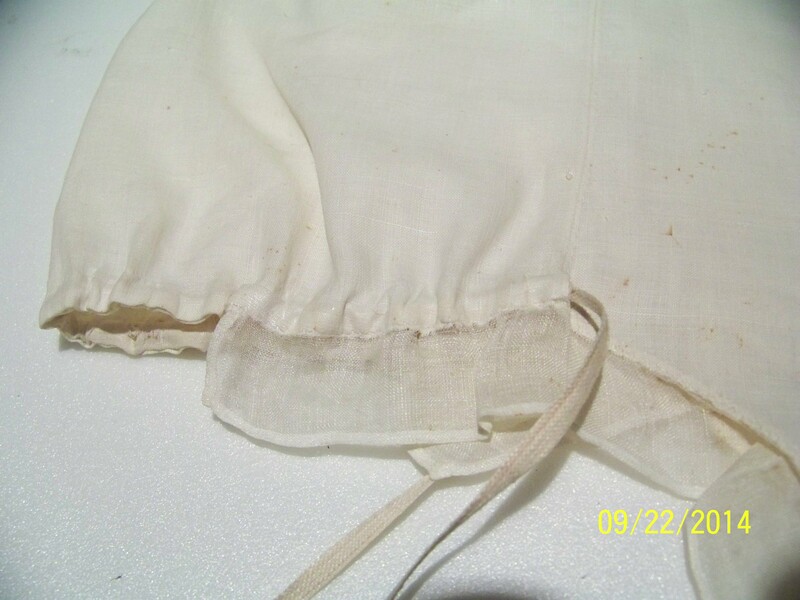 A casing 1/4″ wide along the nape is made of a piece sewn in (I’m not for sure about that, but I can see the edges in the photos) to create the channel for Kissing strings, 18″ long, of 1/8″ linen tape. The tapes come out on the outside, just where the caul, headpiece, and ruffle all come together. The headpiece is pieced at the top, felled together. It is hemmed all around with a tiny hem and then butted to the caul. You can see the stitches, like whip stitches, joining the two, but loose enough that the 2 hems sit side by side. Then the ruffles: hemmed on the front side, and whipped to the headpiece, with a gather only around the lappet tip. The top ruffle is about 1/4″ skinnier than the bottom ruffle. I decided later, when I’d seen a couple more of these, that the ruffle was made from one piece of cloth, folded, and joined through the gutter. The ruffles don’t go all the way around the back, but end 2 1/2″ past the point where the strings come out. Right here, the straight grain of the cloth has to bunch to get around the curve, so although it isn’t actually gathered, it appears so. 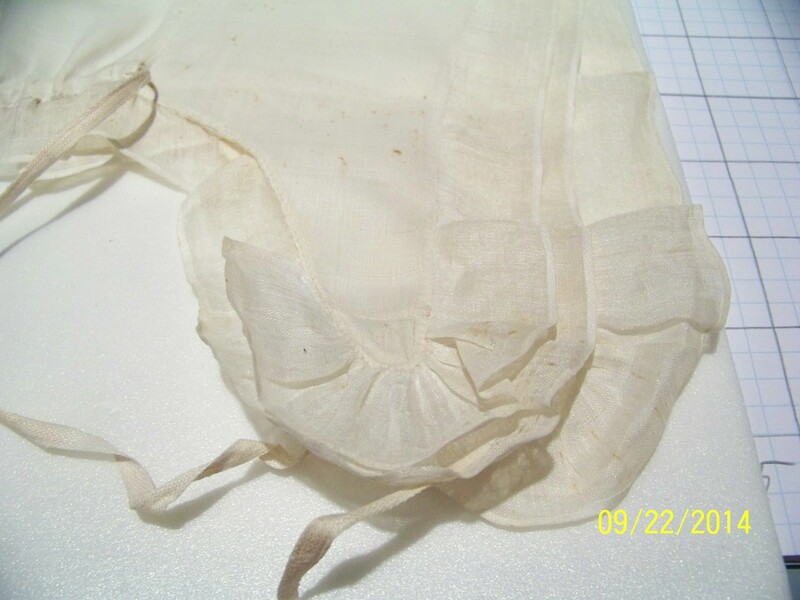 But the top ruffle ends earlier, about an inch past the tip of the lappet…. Which makes me wonder. 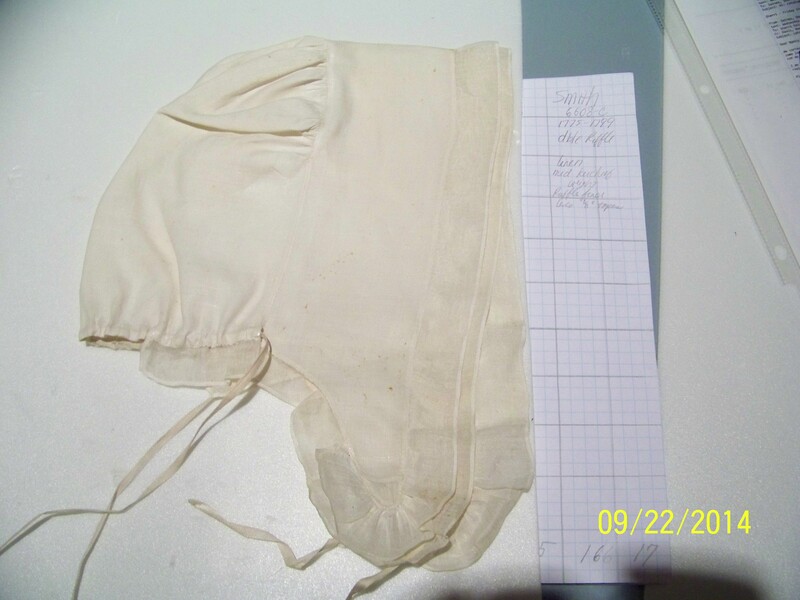 You can see in this picture, which shows the ruffle laid open on the left side, that there’s a little bit of cloth puckered up under there. Last detail: the ruffle goes from 1 1/4″ wide at the CF to 3/4″ wide at the other end, so maybe the difference is hidden here? After this point, there’s a felled join, and the single ruffle finishes the round. What is the little fluff hiding between the layers of the ruffles? The stroke gathers visible inside. And the exact and fine hems and joins. The long tapes come out at the point where the caul, headpiece, and ruffle intersect. You can also see what looks like a pieced channel for the gather. The skinnier ruffle (1″ at its widest) lays on top of the wider ruffle (1 1/4″ at its widest). The folded cloth, once hemmed, would be 2 1/4″ wide, folded at 1″, and whipped on at the fold. … I think. Why do ruffles get skinnier on the sides and back than in the front? It’s confusing because the grain of the cloth is straight on the outer edge, but the inner edge gets progressively more eaten up by the rolling of the whipped join? On purpose? Why? And the Kissing Strings again. Remember Mrs Galloway? Her cap is an exact match. 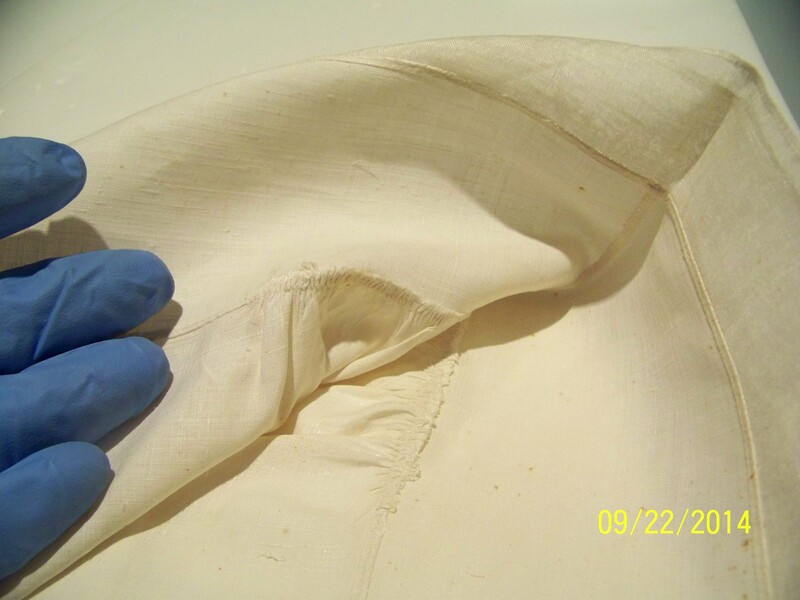 Nancy Davis, Curator of Textiles at the Smithsonian’s National Museum of American History, helped me to identify items in that collection that were useful to this study. That was no small feat, as records were spread across several legacy cataloging systems, and details were minimal. I can only hope I found what there was to find! I am not aware of any other scholarship about this cap. *. . . which is not the same thing as the Smithsonian’s Cooper Hewitt, in NYC. Their textiles section was under construction at the time of this study, so I didn’t get to see their artifacts. 18th C versus 19th C Characteristics for American Women’s Caps. Copyright: In Which I explain how you many and may not use the information in this blog. How is This Blog Different From All other Blogs?